Despite the fact that I don’t have a girl myself, I have purchased some pinks and purples in anticipation of someday having a niece (I have 2 wonderful nephews!) 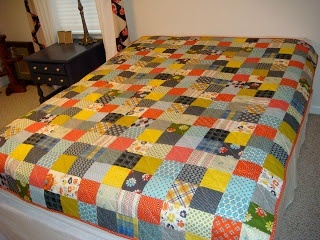 or making a quilt for a friend’s daughter. So when I got my new sewing machine and needed to test it out, I decided a simple square patchwork quilt would be a perfect way to get to know my new machine… and I made it fuchsia! With a little blue just because my mind can’t comprehend a quilt without blue in it. This is the fabric pull I started with. Usually when I do square patchwork I make a little color chart based on a 9-patch. With the one pictured below for instance I made a rule that there’d be a red in the middle of each 9 patch and then designated the 8 surrounding spots with specific colors as well. This helped me get the colors evenly distributed. It also created some very subtle secondary designs that I really like. 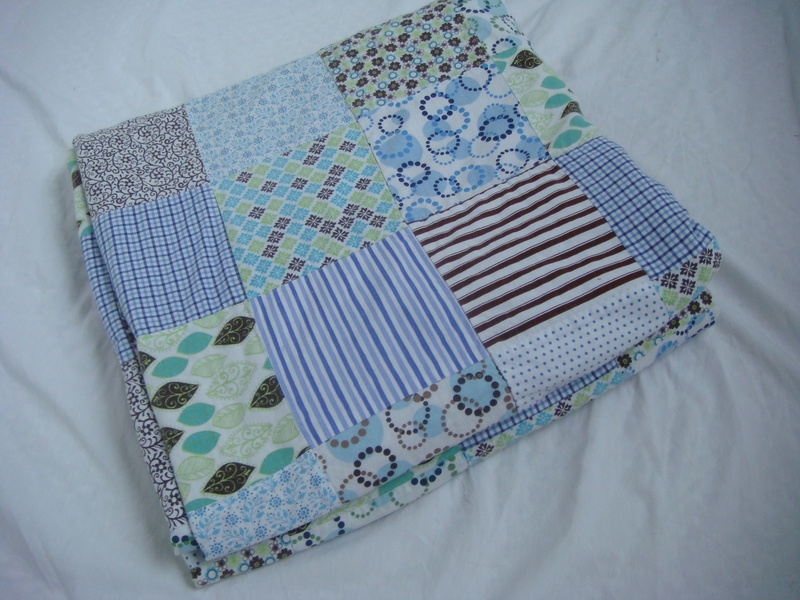 Can you see vertical turquoise stripes and the dark blue-gray lines crossing the quilt at an angle? I wanted to try to loosen up a bit with this one but I’m honestly regretting it. 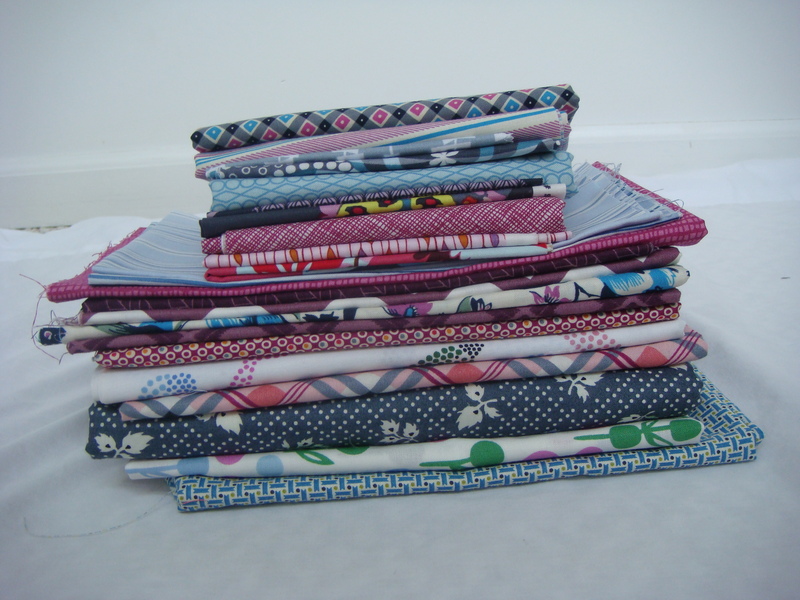 I just sewed them into pretty pairs and then assembled rows of 6 that looked nice together. I figured I’d be able to mix and match it from there but it’s not coming together. I keep getting squares of the same fabric too close together. I don’t have a design wall yet and that may be the problem. Or it might be that there are not enough fabrics to make this work. 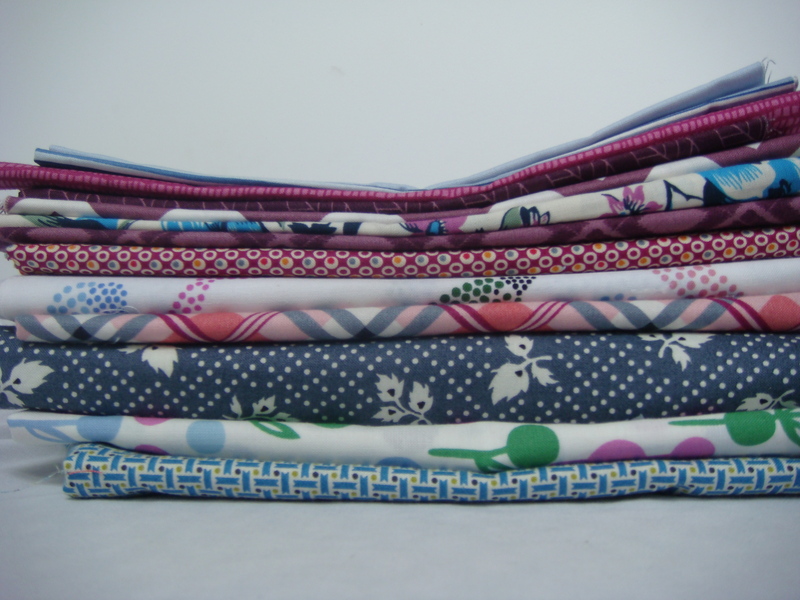 (I keep trying to explain to my husband that it takes A LOT of fabric to create a proper stash…) The last time I made a big fabric order I included a few fabrics (on sale!) that I knew would work with this quilt and my plan now is to unpick it just a bit and hope that adding just a few additional fabrics will help me finish this. I’m planning to do some kind of hand quilting in the solid squares. Almost every quilt I’ve made has had a very specific destination in mind but this one is currently homeless. I think it might be a good contender to start an Etsy store but I’m not sure. 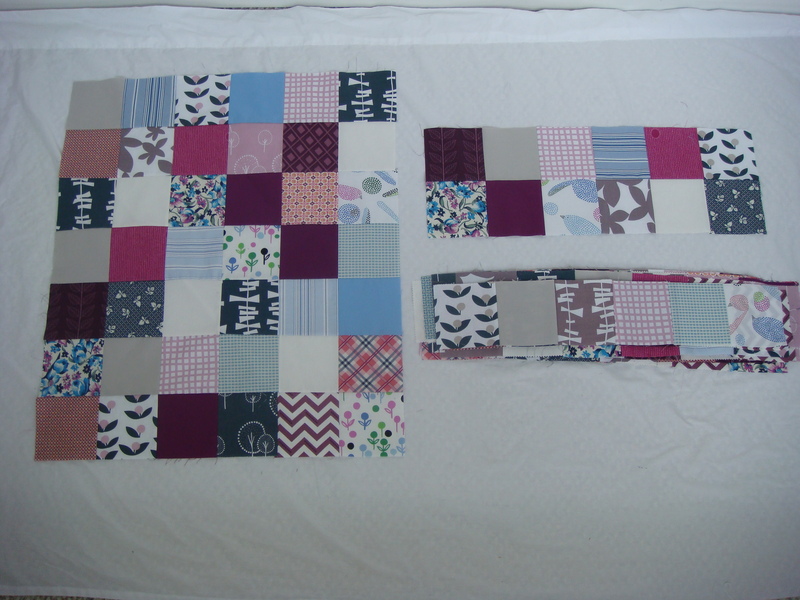 On Monday I’ll share my last WIP quilt and a few recent non-quilt projects. I’m going to take the weekend off! Ha ha this blogging is like a job. But a really really fun one. Thanks for visiting. This entry was posted in Uncategorized and tagged fabric choice, WIP. Bookmark the permalink. 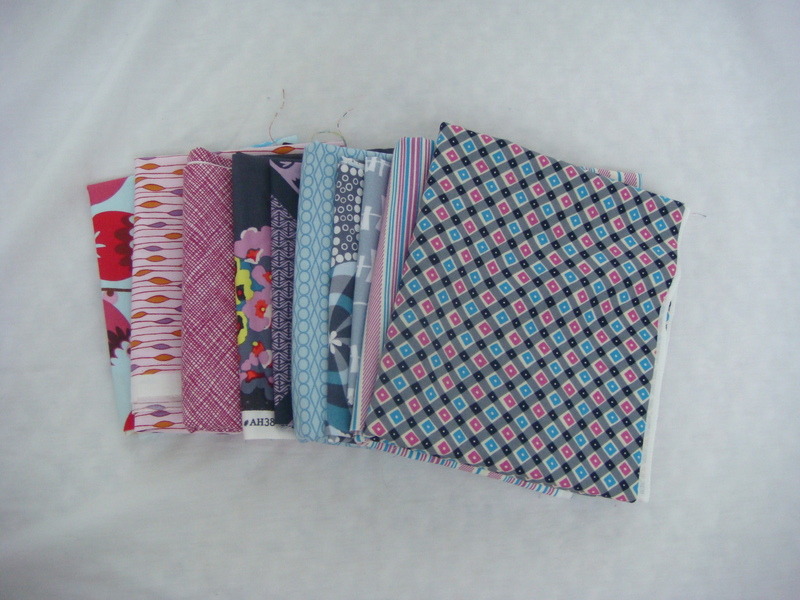 Thanks so much for linking up to New Fabric Friday at Love by Hand. So nice to “meet” you online – glad to find your blog! I inherited my sewing grandmother’s huge stash of fabric, have bought a lot of my own (always using coupons or waiting for sales), and have been given fabric by people when they were de-cluttering their stash. It’s wonderful to have a lot of different things on hand. I wouldn’t unpick that quilt, but if there are spots that really bother you, it would certainly work. Another option, if there aren’t many problem spots, is to place something over an area. Take that new fabric, make a few shapes or letters, and just sew it right over your problem areas, maybe with a zig-zag stitch.